Increasing regulatory demands are a significant challenge. Failure to comply with legislation can result in heavy financial penalties and long-term damage to an organisation’s reputation and market confidence. Every industry has its own set of requirements, and those demands are regularly growing and changing. 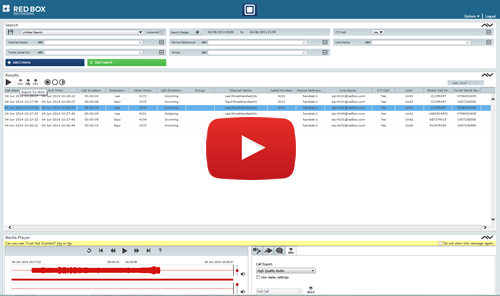 Red Box helps you meet the need for compliance recording. Our Quantify voice and data recording solution enables you to keep a record of all voice communications, store data securely, and comply with strict retention policies requiring that data is accessible for investigation and auditing. Quantify has the flexibility to help you adapt as regulations change. Financial institutes such as investment banks, hedge funds and private equity companies are more strictly policed than ever before and penalties for non-compliance are huge. Regulations vary around the world and organisations need to comply with demands from regulators such as the CFTC and SEC in the USA, ESMA in the European Union and the FCA in the UK. Red Box Quantify enables you to record communications and store records that relate to daily trading and business activity. You can keep data securely to comply with retention cycles, and retrieve what you need to reconstruct events to the satisfaction of auditors. To guarantee that stored records are protected against alteration and tampering, Quantify integrates easily with networked storage devices to deliver Write Once, Read Many (WORM) compliance, promulgated by the latest regulations. Government departments and other public sector organizations that record calls and take payments over the phone need to comply with PCI DSS standards. Red Box Quantify ensures you stay within the guidelines and can focus attention on providing services at great value. Workforce optimization features also make Quantify a great choice for any governmental organization with internal call handling standards to drive high service quality. Organizations within the public safety sector often need to adhere to call handling standards. That’s as well as supporting day-to-day operations and providing evidence for legal disclosure and investigations. Red Box Quantify gives you advanced yet easy-to-use tools to capture, retain and retrieve emergency calls as well as communications from public safety workers in the field. Red Box Quantify doesn’t just help you achieve compliance. It’s also has the resilience and flexibility to help you stay that way. With automated failover and built-in monitoring and alerting, Quantify is proven to deliver business continuity by offering the highest levels of resilience. And it’s scalable and easy to integrate with your choice of technologies. Red Box Quantify is already protecting people and businesses in even the most regulated markets. That’s why it’s the smart choice for compliance. With Red Box Quantify, don’t pay for features you don’t need. Just choose the ones you need to help you achieve compliance.